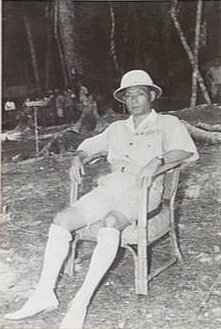 Baron Samejima Tomoshige was aide de camp to the Emperor until November 1942, when he took command of naval air forces at Rabaul. He served as temporary commander of 4 Fleet at Truk, relieving Inoue after the latter fell from grace with the high command. He was present at the battles of Kolombangara and Empress August Bay. In October 1944 he likewise relieved Mikawa as commander of 8 Fleet at Rabaul and remained at this post until the end of the war.